And because I am such an efficient blogger, I didn’t realize that I haven’t blogged about our visit to Isdaan in Gerona, Tarlac after our crazy Batanggas-Ilocos Trip that happened last May 2012! Almost 2 years ago I know! Nyahahaha.. Anyway, on our way home from Ilocos, we all decided to drop by Isdaan in Tarlac for lunch. We still have extra money from our funds and so we decided we could splurge. And I think one of us suggested we try Isdaan in the North. It was my first time in Isdaan. And I immediately loved the place. It was surrounded by man-made ponds and you’d have to stay in a kubo to dine. Very Filipino I must say. And they really invest on nice decorations and huge statues. Kids and kids-at-heart would definitely enjoy the place. The kubo where we ate is decorated with everything Filipino. 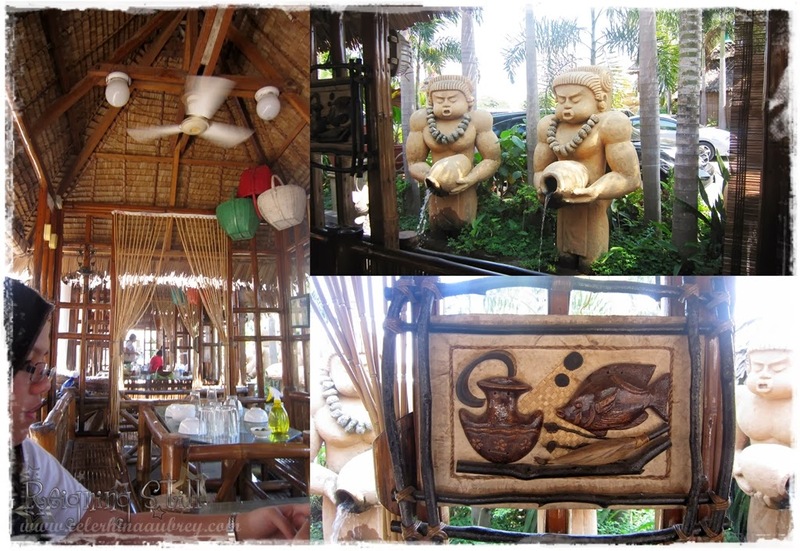 From the high sawali ceiling to the capiz decors and shell curtains to the high ceiling fan and woven baskets all over. Our chairs and tables are made of kawayan so it was breezy even though there’s no AC. Aside from the very nice place, they also offer entertainment - they have singing cooks and waiters! And I loved watching Filipino folk dancers do their thing as I munch on my Filipino dishes. It was THE ultimate dining experience! I really had so much fun! Here are some of the dishes we tried. I wasn’t able to take note of the price but it is a bit pricey for a provincial resto. Like Manila Restaurant levels. But if you’ll consider the experience and of course, the taste, it’s all worth it! I love everything they served. As in wala kang itulak kabigin. Even the Kilawin is yummers!!! It’s raw fish cooked in vinegar and it was heaven. We all had a great lunch which is perfect for the long travel ahead. So if you’re on a road trip to the North, I suggest you swing by Isdaan in Gerona, Tarlac and feast on their food for that perfect adventure.